UFC 133: Evans vs Davis’ fight card is now complete, as the promotion officially included a middleweight scrap between Rafael ‘Sapo’ Natal and Constantinos Philippou last Saturday. The upcoming tournament will feature a pivotal light heavyweight match between former champion, Rashad Evans, and rising star, Phil Davis. The main card, which will air via pay-per-view, will also headline the return of Vitor Belfort in the Octagon against Yoshihiro Akiyama. 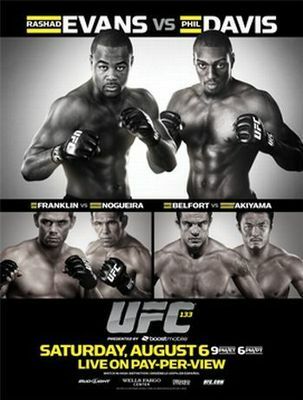 UFC 133: Evans vs Davis will go down on August 6 at the Wells Fargo Center in Philadelphia. See the complete lineup below.